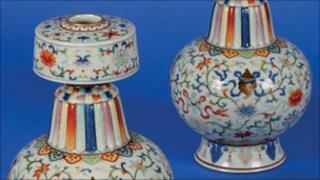 A pair of Chinese vases discovered in a retired couple's home have sold at auction for £500,000. The 10-inch high, Qianlong dynasty porcelain pieces were given to the anonymous couple from Southampton as a wedding present in 1965. They were sold to a foreign bidder on the telephone and were originally valued at between £40,000 and £60,000. The couple said: "We are absolutely delighted and are going on holiday. This has transformed our retirement." Guy Schwinge, from Duke's auction house in Dorchester, Dorset, found the vases on a shelf in an upstairs bedroom of the property. He said: "The sale underscores the exceptional market for mark and period ceramics of the Qianlong period. "Desire for the mark and period Qianlong porcelain is now even greater than for ceramics of the Ming dynasty. "This pair may belong to a group of ritual wares that were specially commissioned by the Qing court for placement on Buddhist altars or for ceremonial use in palaces and temples." Qianlong was the fifth emperor of the Manchu-led Qing Dynasty, and the fourth Qing emperor to rule over China. The fourth son of the Yongzheng Emperor, he reigned officially from 11 October 1736 to 7 February 1795.